Hostiles opens with a scene in which a family’s home is besieged by an Apache tribe, who kill the man of the house and his three children, including a newborn baby, leaving the anguished mother (Rosamund Pike) half-crazed with grief. We then meet two soldiers as they sit in near darkness and boozily reminisce about their past exploits, such as the time when one of them sliced a Native American "from stem to stern." Ah, good times. 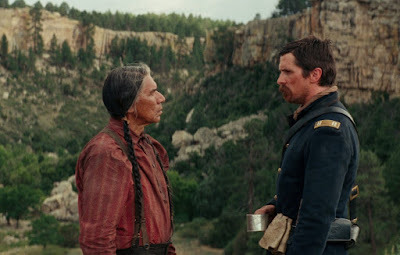 Shortly afterwards, when Captain Blocker (Christian Bale, looking and sounding like a young Sam Elliott) is tasked with escorting an ailing Cheyenne chief (Wes Studi) to his home so he can die on his own land, he responds by walking out into the wilderness and howling at the sky at the injustice of it all. These characters hadn’t even begun their journey, and already the film’s pervading sense of despair and violence was suffocating. That, it seems, is the Scott Cooper way. Like his last two films Out of the Furnace and Black Mass, Hostiles moves from the first scene with a gravity it hasn’t earned, as if presenting itself as a serious piece of work is enough to ensure we should take it seriously. Cooper's slight but charming 2009 debut Crazy Heart now feels like an outlier, as each of the subsequent movies have been defined by a brooding demeanour and a focus on violent, tortured men. It’s hard to recall any characters in his films cracking a smile, unless you count Johnny Depp’s sinister grin in the lamentable Black Mass. 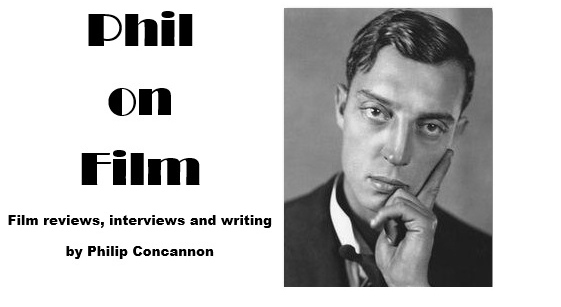 The problem is not the grim tone, the problem is a lack of inspiration and ability. There is nothing in Cooper’s direction or storytelling to elevate this material. It just feels like we are dutifully trudging across old territory. Hostiles is essentially Cooper’s spin on The Searchers. As the racist and vengeful Blocker reluctantly shepherds Yellow Hawk (Wes Studi) and his family, he gradually comes to see the humanity of the man he once despised and learns how alike they are, but Cooper fails to illuminate this path to understanding. When Blocker tells Yellow Hawk towards the end of the film that “a part of me dies with you,” it doesn’t resonate because the film hasn’t dramatised his changing perspective effectively. Blocker spends most of his time interacting with Pike’s Rosalie Quaid (his upright, courteous behaviour is quite touching) or the various characters they meet along the way, such as Ben Foster’s convict, who reminds Blocker that they have both lived violent lives and that he might be the one in chains under different circumstances. Much of Hostiles consists of these men reckoning with their violent pasts, with Rory Cochrane’s gradual breakdown being the most strained aspect of the film. The scene in which he tearfully apologises to Yellow Hawk for everything that has been done to his people and hands him a bag of tobacco as a peace offering just feels like the filmmakers paying lip service to the plight of Native Americans. It would have been better if Cooper had given them a voice of their own. It’s a fatal misjudgement for the film to have Yellow Hawk and his family (Q'orianka Kilcher, Adam Beach) existing primarily as mute props for Blocker’s enlightenment. Given the film’s 135-minute running time and many dry passages, it’s astonishing that Cooper makes so little effort to share the Cheyenne characters’ point-of-view or to give them any sense of an inner life. Wes Studi is a great actor and a unique screen presence, but here is asked to do little more than remain stoic, noble and silent – it is such missed opportunity. As I watched Bale, Studi and Kilcher together on screen, I couldn't help wishing I was watching Terrence Malick’s The New World instead; a film with the empathy, curiosity and imagination to see the world from multiple points of view.